Fully equipped with central heating and air, 3 bedrooms (two with queen/full size beds and the third one with a set of two full size beds + 2 rollaway beds if needed) 2 bathrooms and a Jacuzzi in the master bathroom. The kitchen is furnished with cooking and eating utensils, a dining table for 10, a great room with an impressive fireplace, stereo, DVD and television. 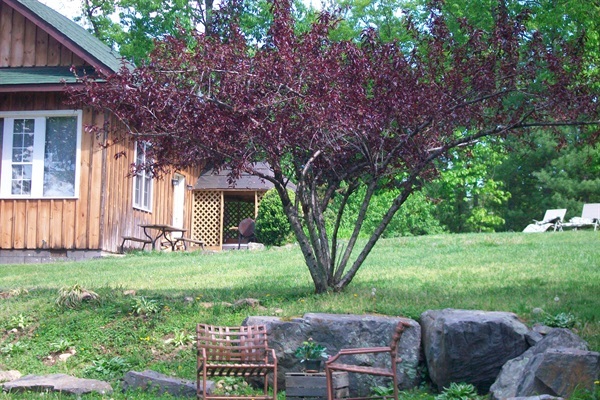 For your evening pleasure, there is a front wooden deck and a side patio with a gazebo, hot tub, picnic table and BBQ. At arrival time, if you wish to pay the balance with a Credit Card, a processing fee will apply. Personal Checks or cash can be accepted. Please check in at the location provided on the "Directions Section"
Check-in time is 2:00 - 3:00 pm - if planning on arriving at a later hour, please include the time in the form below, or notify us by calling us. Primary Offices will be closed at 5:00 pm. Secondary Office will be closed at 9:00 pm. Check-out time is 11:00 am - An additional fee equivalent to 50% of one night rent will apply for an unauthorized late check-out. We make every effort to provide all of our visitors with a pleasant, accommodating and secure stay at at our lodges, and to guarantee a confirmed reservation we require a 50% non-refundable deposit. Changing dates could result in a cancellation fee; however, if there is a valid reason for which you would need to change dates, we will strive to make the most suitable arrangements if you call in advance. Failure to show or early departure: the customer will be responsible for the total amount. We recommend that during rain or snow seasons, be informed on the weather of this region so you can prepare and travel accordingly (we will not be responsible for cancellations due to weather or other acts of God.) In case of extreme weather conditions in our region, negotiations could take place. Late check-in (after 9:00 pm). if you will have a difficult time arriving before 9:00 pm, you must make arrangements in advance by calling the office 540-743-7311. We recommend that you prepare your trip in advance and become knowledgeable beforehand on your travel time and our directions. Our directions are posted below. In order to conserve energy, we turn the temperature down on the hot-tubs. If you are planning on using it upon arrival, please let us know in advance - this apply to Three Sister's View, Valley View and Sunrise Ridge only. We appreciate your business and would like to know if there is anything that we could do to help make your stay a pleasant and memorable experience.